I’ve just printed off my speaking notes for Adelaide. 74 pages, and 20,000 words in note form. That’s a lot of work! It’s something I’ve been working on for nearly a year now, using a range of places to workshop stuff. Aim of week: To provide stimulation for our ministries as children, youth, family workers by weaving together selected Biblical narratives regarding families, together with contemporary missiology. 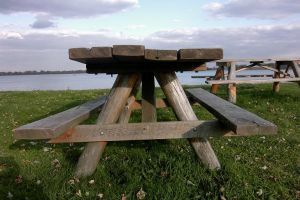 Key image – tables: You sit at a table. The people in your ministry context sit around tables. Jesus sat at tables. Many Bible narratives occurred around tables. What narratives and insights – Biblical, ministerial, missional – can shape our “table” ministry? My context: I come not as an academic with a lot of well polished talks. Instead the material is tentative and on the run, shaped by 6 years helping an established church refind a heart for local community ministry. This conference has provided a chance to go back through my hard drive, trying to pull together key moments and learnings and shaping narratives, with specific regard to family ministry, and to realise this recurring theme of table. And so to offer the fragments to you, wondering what you will find as we sift life and ministry together. I am looking forward to that with you. A more thorough outline is here. The angelwings research team has also cooked up some case studies – 4 different contexts in which ministry can be happening – and I’m looking forward to seeing what participants make of them. While I am in Adelaide, I’m talking with a publisher about the possibility of this becoming a book. Just an exploration. But it seems to me that there is very little written on ministry across the generations from a Downunder perspective. Even less that is closely attentive both to Biblical narratives and to contemporary mission insights. So there might be a hole needing filling. It certainly would be nice to see 74 pages and 20,000 words find life not just for 1 week, but in an ongoing way. (I’m also doing stuff here and here plus this lovely comment (final paragraph) here). I’m thinking tables at the moment. It’s seems to be the most helpful metaphor for the Breathe conference I’m speaking at next week. I’m speaking to a mix of children, youth and family workers and it seems to me that all ages potentially sit at tables – children, mcdonaldised teens, young adult cafe dwellers, families. The need for long tables as essential to a church foyer came up last week. So a conversation this week got me spinning on another dimension of tables. A parent shared how tiredness, personality and family size made table talk over meals difficult for them. And their need for ideas and support in this very practical area of talking over food together. It got me wondering about the place of shared family food. Imagine a big long table in a church foyer at which families sat to eat, talk and catchup on the week. It would be a participatory table, in which everyone brought something, it might be food, it might be a joke or an item, it might be a willingness to set or clear the table. In other words, this was not a free lunch, but a family working together – not a nuclear family so beloved by Western culture – but a larger family. Surely it would be no more work than a meal at home. Meeting weekly, even fortnightly, I reckon that it would strengthen families and offer real, practical, tangible relational support, modelling inter-generational relationships and providing mentors and advocates. Now, with Opawa’s building project still on track for a end of September completion, meaning a dishwasher, kitchen, coffee machine, all integrated into one sensible space ….. This was the prayer from Sunday morning. At the door on the way into church, everyone was invited to choose a piece of jigsaw. Introduction: As you came in you should have been offered a piece of jigsaw. I invite you to hold that now and to consider our theme of mission. Mission here. Mission there. 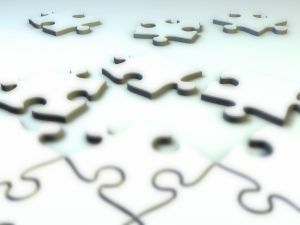 The jigsaw invites us to consider what small part we have to play in God’s mission. As a jigsaw is 1 piece with 2 sides, so mission can be expressed here. And there. Prayer: So I invite you to look at 1 side of the jigsaw and consider your part in God’s mission here. And now to turn the jigsaw and consider your part in mission there. (And so the jigsaw was turned about 5 times, naming various involvements. For example, HERE included re-start of community kids programme, 85 people who attended the family film night, the flu packs, our mission collectives, while THERE included missionaries we know, seeds our missionaries in history have planted, the children many of us sponsor). Ending: (excerpt from prayer by Nakatenus, 17th century priest, adapted). God of Christ Jesus, the task of loving every neighbour as we love ourselves has become too big for us. The world is now too small, it’s population too large, the burden of its evil and misery too enormous. Therefore we pray to you for common sense. Let each of us be ready to do what can reasonably be done, play our piece in your puzzle, and leave you to put the jigsaw together. Amen. And to place that alongside the creativity that has gone into their new concert: 360 degree stage and all the technical mountains that required surmounting …. The introduction to Sunday’s sermon produced a number of requests for the recipe for Steve’s vegetarian lasage. Slice whole pumpkin into halves. Cook in oven for 60 minutes. Leave to cool, then deseed and de-skin. Set aside. Slice onion and garlic. Cook in oil. Add finely chopped celery, then grated carrot. After a few minutes, add paprika, chili powder, oreganon, followed by tomatoes. Simmer, the longer the better. Sweat silver beet, spinach and brocolli for a few minutes in the microwave, in a covered container. Make a white sauce by melting butter, mixing with wholemeal flour. Slowly add milk. Toward completion, add pinches of nutmeg. Layer the lasagne. Start with the tomato mix, followed by sheets of pasta and white sauce. Add slices of cooked pumpkin, sweated silver beet, spinach and brocolli. Add another layer of tomato mix, pasta sheets and white sauce. Top with grated cheese and crumbed nacho chips. Cook for about 60 minutes. (If smart, you will at the same time, cook the pumpkin for the next lasagne, which can then be frozen). Note that in this recipe, the following are all homegrown: pumpkin, onion, carrot, celery, silver beet, spinach, brocolli and tomato. We had Steve Maina, from Church Missionary Society lead Bible days yesterday. What a gift! A lot of synchronicity in the room: the Bible days topic (based on the lectionary) being the book of Acts, Steve being from Kenya and working for Church Missionary Society, the date falling in Opawa missions week. Steve was superb. Passionate. Enthusiastic. An intellectual capacity, combined with a depth of study. Fresh eyes. He kept hammering away about justice: that the book of Acts is about justice – about the Spirit being shared between ethnic groups, about wealth distributed fairly. Take the gift of tongues. For years this has simply been a dog fight between Pentecostals and non. But when you consider tongues as an outworking of God’s justice, then Acts 2 and Acts 11, become a reminder of Gods’ favour upon outsiders. New ethnic groups have just as much place at God’s table as any other. Up goes the mirror: the dog fight over tongues is framed simply as justice. Do our church structures and policies and mission need to flex, to ensure an equal voice for all? Are Pentecostal ways of leading justly participatory? Are Baptist church meetings places of justice, where everyone has equal voice? Bible days are proving such a gift. This is the fourth – John, 1 Peter, 1 Corinthians – now Acts. The next at Opawa is 2 Samuel on August 15. So often I see the Bible used either badly or loosely. Bible days brings intellectual resources into the community. It allows people to consider the Bible within bigger picture frameworks. It’s a living reminder that we need to engage the Bible in multiple ways – sermonic, lecture, lectionary. It’s allowing us, in a sustainable (every 6 weeks) to focus on the Bible. It’s bringing the academy into conversation with the pew. Sorry if this is sounding a bit like a stuck record, but there’s a lot happening mission wise at Opawa at the moment. When the church building project first came to the Board back in 2007, we discussed the danger of a building project turning the church inward. I’d come with a mission call, not with a “building call.” To help us process our priorities, one of the questions I asked the Board was how on earth we would explain a $500,000 building project to a solo mum in our local community. (We also read our Bible text for the year and asked each other how the building project would move us toward that Bible text). And we made a commitment to each other – that we would do both: build and keep our mission. So it is great, three weeks into a 12 week building project to reflect on the week past. On Thursday this week, Shiloh re-started. 10 children, which is a third of the girls at Waltham in the target age range turned up and it was a great first night. It means we as a church now minister to youth and children five days of the week: with Brigades on Tuesday, Opawa Baptist Youth on Wednesday, Shiloh on Thursday, mainly music/Koru/family film night on Friday and services on Sunday. That’s a lot of love! On Friday I walked into the church to see the first bach of flu packs scattered around the foyer. They are superbly presented, packed with a range of goodies, ready to be dropped off at the local school and doctors, for them to give into the community. It is so encouraging to be part of a team and a church on a journey that is keeping both mission AND building in our planning, dreaming, visioning. The local solo mum has somewhere to send her kids and a flu pack, given the likelihood (79%) of her family catching flu. When the project is done, she can hang at the long table enjoying a cafe then catch a parenting group in the larger foyer. I came to Opawa Baptist in 2004 with some dreams. One was that the mission of God, as discerned in the local community, would over time change the church. This included a clear mental picture of a church in which the insides – the physical architecture – became different as people from the community found love and acceptance. It’s now 2009. Last night was the end of term evaluation of the Gathering. The Gathering began in April, in response to people from the community needing a discipling space in our midst. It happens not at the church, but at our local community centre. Weekly, always with food, each week explores a Bible passage followed by a free flowing discussion. Like anything new, it had no guarantees. But local people have gathered, feedback has been very positive and the “guiding” team remain energised. It’s one of the best things about Opawa this year, this gathering of local folk, previously not in church, in belonging and around the Bible. There’s such a deep joy in growing deep and strong relationships with our church neighbours. A key feature at the local community centre is a long table. It’s where the Gathering has taken place. Everyone sits, so all are equal. It’s where food is served and the Bible is opened, where stories are told and real life mixes. And my eyes sparkle! YES! Our/God’s mission, as discerned in the local community, is over time, changing the church – physically! It’s moments like this that make pastoral change processes worthwhile. Updated: a wise friend took this one step further. He suggested that we build our own tables. Which started another spin of creative options – could the “long table” then be the church communion table? Could each congregation provide their own table for the new cafe space! another chance, last chance, to experience the Pentecost Spirit art installation at Opawa. Saturday, 25th July, 8 pm. A great ending to our missions week. how much land do you require to feed a family of 3? 10 square metres which was the size of the demonstration vegetable garden at Heronswood, growing enough vegetables to feed a family of 3. The shop sold a seed pack, for I think about $45, containing all the seeds you need. $45, a bit of back garden, exercise and peace outdoors. Makes you think doesn’t it. would you like an icon with that? Their task is to live with that icon for 2 months. During that time they have to interview 3 people about what this icon means to them and how this icon shapes society (positively and negatively)? In light of the icon and these interviews, students are required to reflect on: (a) In what ways does this icon provide a window into contemporary Western society? and (b) What challenges does this icon present in relation to the Christian gospel? The task is based on what I have found to be a very helpful diagram in Metavista: Bible, Church and Mission in an Age of Imagination . It portrays cultural hermeneutics as three interlocking circle: cultural icons, societal imagination, the nature and encounter with the gospel. So inviting the students to engage a cultural icon (I used Third Way’s Icon of the month series) is a way of inviting them to consider the underlying narratives forming these icons, and what the gospel might then say in response. I am looking forward to seeing where the journey takes them and the class. The first time I taught this course back in 2004, I chose the icon. It was a McDonalds hamburger. I brought one as the course commenced. Each week the burger was gently placed on the desk. By the end of 15 weeks, it still looked pretty much the same as that first week. Slightly harder, but so well medicated that it all bugs and bacteria remained firmly at bay. As part of my weekend, my hosts took me to Heronswood. It was interesting to wander the place, thinking about how mission and church life. You see, here I was an outsider. I’m not a convert, not an “organo-freak” and I’m a tourist, visiting Australia, just passing through. As I wandered, asking myself: how many entry pathways do communities of faith offer? how many types of learning do we encourage? how many “give-it-a-go,” beginners type resources do communities of faith offer? 1. A space: a historic house and established gardens, around which one could wander, free of charge, absorbing the peace, or pay a small entry fee to wander another part of the garden. 2. A cafe: selling a range of food, a real try before you buy experience of new vegetables and imaginative possibilities. 3. 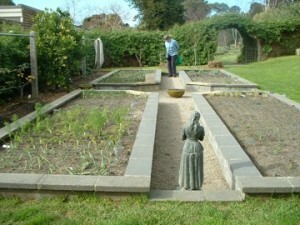 A demonstration garden: ln which new vegetable varieties were grown, stretching the imagination, offering possibilities. Tied to this was a demonstration plot showing “the size of garden needed to feed 3 people for a year.” It was quite stunning to realise how little a space of land was required to grow vegetables. 4. Which was tied to “product” in the form of plants, seeds and books. You could buy those new possibilites you see in the garden. You could purchase the seed pack required to start your own garden. 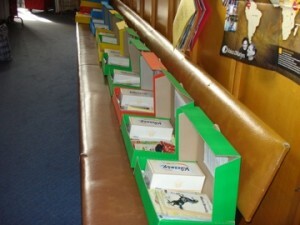 Lots of resources were targeted at beginners, both books and hands on starter kits. 5. 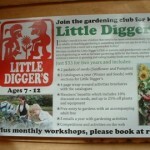 Regular workshops were offered, in how to plant, compost, harvest. A chance for relationships, a chance for those who might not get books, but might learn by hands on practice. 6. A festival, twice a year, offered a chance to celebration. 7. 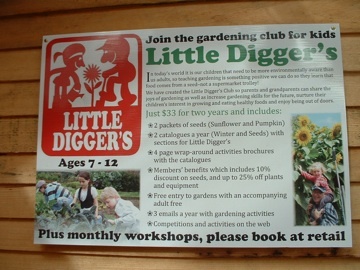 A committed core, the diggers club (what a great name) in the form of a membership group. What would it mean to stimulate our thinking by placing ecclesial life and mission alongside this type of multi-faceted place, the hands on experimentation, the one-off workshops, the festivals, the demonstration plots, offering a wide variety of ways to access? Most churches offer a church service, which is essentially targeted at (7) the committed core, the members, those inside the community. If they get missional, they run (2) a cafe or a variety of community facing programmes. But it pales into insignificance alongside workshops, festivals, product, demonstrations, space and core. A common response when I talk about spirituality2go is “lack of resources”, yet this was at heart a business, who have find a way to offer their resources in a sustainable financial model. Another response is the limitation of buildings. Yet here was a place defined by a building – the old homestead – at their centre, who had simply built pathways and produces in and around this. 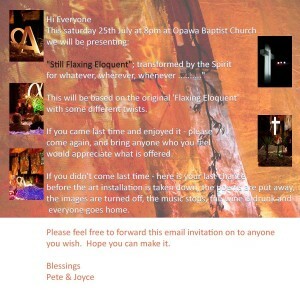 Opawa has made some moves in this spirituality2go direction. Our lenten wilderness blog, our 7 practices, our art installations (and an article on whether the Opawa art installations are foyer or signposts) are all hints. But there’s so much more to explore. I tie this post to a chapter of my book, on spirituality2go, on Pete Ward’s concept of Liquid Church and to a recent post by glocal, asking where are the beginner resources in missional church. 1: From PNG: The church is harmed by “grasshopper” Christians, those people who just jump from church to church, always chasing a blessing and seeking something better. 2: From Aboriginal Australia: The gospel calls us to be one, but it also calls each member to be unique. So the task of mission is to help each member helped to find their own God-given identity. That is our challenge: to be truly, authentically Aboriginal and Christian in a post-modern Australia. 3: From UK: research into letters kept in the British Library shows that William Wilberforce enjoyed a sustained correspondence over many years with key Baptist mission leaders and had a deep admiration for the work of the father of modern modern, William Carey. My paper – Baptist Worship and Contemporary Culture: A New Zealand Case study – went well today, with some helpful feedback and good endorsement. With a few editorial tweeks, I hope it will get published down the track (as part of a Paternoster series). 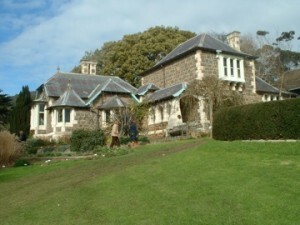 Tomorrow I head down the Peninsula for a weekend with friends. Yep, a weekend away from Opawa. It means I miss the start of missions week, and the preaching of Paul Windsor. In recent weeks I’ve been enjoying the spiritual practice of composting. As with most spiritual practices, it has been a mix of great fun and hard work, pulling on the gumboots and old jersey, lugging around big bags of animal manure, tossing straw, shovelling and raking. For me, making compost has become a spiritual practice that connects me with God and helps me pray. As I compost, I think about my local community and people who are not yet in faith. I recall the people I know who are really struggling with life. I think back over the TV news, holding before God, the life situations that seem bleak and barren. I wonder if composting was part of what God was doing in Genesis 2. The story describes God planting a garden. Given the detail, the slow and careful pace in the Bible narrative, there is this sense of the garden taking time, sort of evolving. God is the careful composter, mixing love with manure, compassion with planting, dreams of fruitful relationship as life is blown in human nostrils. Reading Genesis 2 has begun to turn my act for composting into a spiritual practice, an act of communion with Gardener of the Universe. 1 Corinthians 13 reminds us that hese three remain: faith, hope and love. Composting is an act of faith. You place compost on the garden in autumn. You let it sit over the winter, with an occasional turn and toss. And come spring, newly planted vegetables will be growing green and I’ll be preparing to saying “Thankyou very much” over a summer salad. So I compost in faith, that in darkness and amid the muck, things might yet grow. As I compost, I am reminded that new life, indeed, all life, is out of my control, beyond my action, logic or planning. Composting is an act of hope. I affirms that in the very midst of autumn decay, through the bleak breakdown of winter, things might get grow, that death is never the end of the story, that confusion and chaos, are simply the raw material for a fresh start. Composting is a prayerful act of love. To care for the soil becomes for me a practice both of loving God’s earth and prayerfully caring for people. In the peace of my garden I let go, offering people and places to God, inviting God’s power into the dark places of the world. Composting. It has become a spiritual practice that connects me in prayer with God and my world.